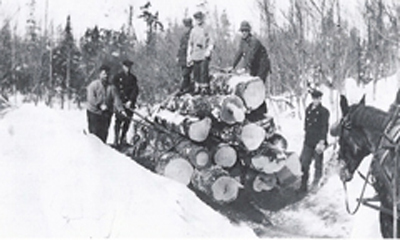 Logs were transported by sleigh from surrounding forest area to be shipped by rail. The greater ease of moving logs made this primarily, a winter operation, which was carried on from skid piles and open storage until 1897 when the first building was erected on the present site. The structure was primarily for the drawing of lumber and the manufacture of rockers for resale to chair manufactures. One of the landings used to stockpile logs from the Blount Lumber Company’s eastern saw-mills was located in the Town of Boylston, just east of Smartville. Here logs cut on company property which once totaled 30,000 acres of timberland were re-loaded for transport to the Lacona saw-mill after its construction in 1914. Blount Lumber was one of the earliest industrial owners in Northern New York to practice re-forestation of cut-over timber tracts. Have you picked up your copy of the Blount Lumber Company Book yet? Stop by the Sandy Creek Town Hall or the Lacona Village office for your copy.